I finally saw a butterfly visit my potted plants today! Beautiful, it looks fabulous on black. Beautiful image Ann, quite dramatic on that black background. Gorgeous capture with gorgeous colors. THANK YOU so much for all those views, comments and favs- wow! I never expected this one to land on the pp as it wasn't really the best shot in my opinion! But I was so excited to see a butterfly I just had to post it. Well, as usual you folks made my day! Looks like a beautiful painting. But it isn't a painted lady from what I can see. Excellently processed - quite apart from the capture itself. 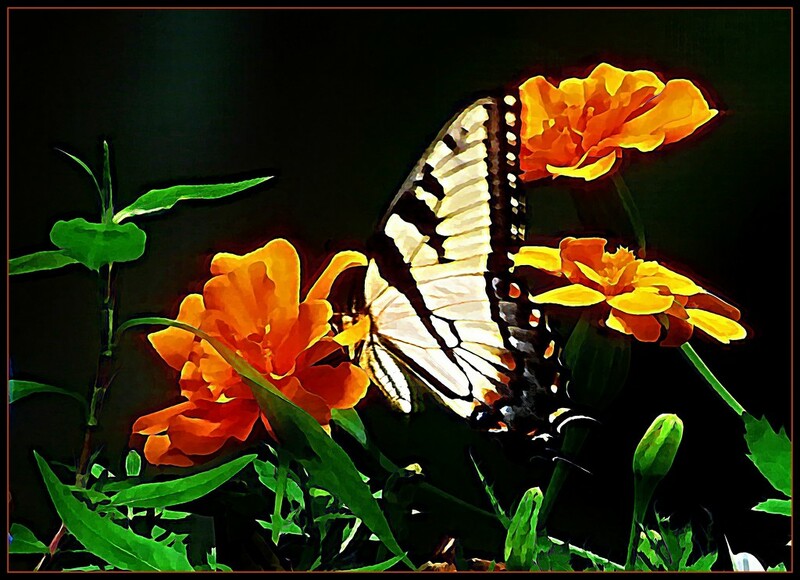 @helenhall Thank you Helen- no, it's a Swallowtail and your eyes were correct in perceiving it as a painting because I did apply a painting style effect to the shot overall and then erased it on the butterfly. @louannwarren Thank you Lou Ann! @robz Thanks Rob! It seemed to bring out the color more than just leaving it sooc.